I wanted to incorporate some quilling into this card. 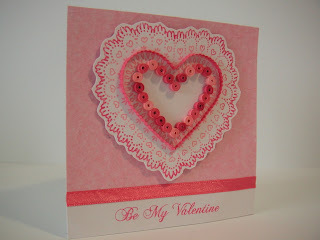 I stamped the heart doily on a separate piece of card, I used a light pink ink then added a rose bud pink around the edges. I crimped a strip of quilling paper and carefully glued this to the card on it's edge in the shape of a heart. I made a series of closed coils in three shades of pink quilling paper. I glued these in the centre of the heart following the shape of the stamp. The card itself is just white card, I added a square of pink paper to the top section of the card, I stamped the text at the bottom and added a piece of satin ribbon between the two. I secured the stamped heart doily with some foam pads. I like the variations of pink in this card. Rubber Stampede Large heart doily, Create and Craft Be My Valentine. Very pretty! I like the shades of pink you used and how perfectly shaped the quilled heart is. Thanks Ann! You have a great blog, just had a look at it. I love the rose tutorial, I've been finding it challenging to make a decent looking rose!